An attractive Semi Detached House situated in a popular residential development convenient to all Town Centre amenities and the Bridge Primary School. The property should appeal to the first time buyer or investor. An early inspection is highly recommended. ** Utility Room with W/c Compartment. ** White Bathroom Suite with Shower Cubicle. ** Mostly PVC Double Glazed Window Frames. ** Neat Easily Maintained Front and Enclosed Rear Gardens. ** Generous Tarmac Driveway with Ample Parking. Accommodation: Open Porch with tile step. PVC Hall Door with double glazed stain glass inset with double glazed side panels to bright spacious reception hall, dado rail, telephone point and laminate wood floor. Lounge: 13’1” x 13’0” (4.00m x 3.96m). Mahogany fire surround with marble inset and hearth, wired for wall lights, television point and laminate wood floor. Kitchen/Dining: 19’7” x 9’8” (5.97m x 2.96m). Range of Oak high and low level units with ampleworktops, single drainer stainless steel sink unit with mixer tap, cooker space, plumbed for dishwasher, fridge space, under stairs storage, two walls fully tiled and tile floor. Spacious Dining Area with laminate wood floor. Utility Room: Single drainer stainless steel sink unit, plumbed for automatic washing machine, partial wall tiling and tile floor. W/C Compartment: White suite comprising w/c, partial wall tiling and tile floor. Bedroom 1: 13’6” x 10’0” (4.12m x 3.06m). Range of built in wardrobes (measured to back of wardrobe). Bedroom 2: 9’4” x 10’0” (2.86m x 3.06m). Built in wardrobe. Bedroom 3: 10’1” x 9’4” (3.09m x 2.86m) at widest point. Laminate wood floor. Bathroom: White suite comprising panel bath, low flush w/c, pedestal wash hand basin, corner shower cubicle with Heatstore shower, tongue and groove pine ceiling, half wood panel walls and vinyl floor. Integral Garage: 18’8” x 9’0” (5.70m x 2.72m). Central heating boiler, light and power. Exterior: Neat easily maintained front garden in lawn with well stocked shrub bed. Generous tarmac driveway with ample parking space. Enclosed rear garden in lawn with mature conifer screen, paved patio area and water tap. 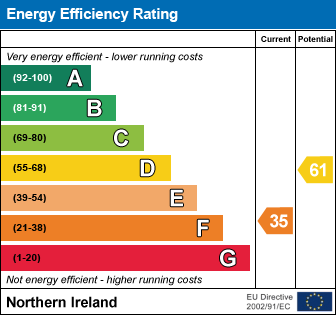 I am interested in 60 Larchwood, Banbridge. Please contact me about this property.